Eugene Alton Lance age 84, of Ashland, died Monday June 18, 2012 at the Grant Medical Center in Columbus. He was born January 15, 1928 in Creston, Ohio, the son of Carl J. and Lydia M. (Kollert) Lance. He attended school in Creston until the 5th grade, when the family moved to rural Ashland County in 1939. He attended school in Nankin until 8th grade graduation, and then attended Ashland High School and graduated in 1946. He also attended Ashland College. Mr. Lance entered the U.S. Army in 1946, took infantry Basic Training in Ft. McClellend, Alabama, and upon graduation in September 1946 was sent to Korea. He served in Korea until March 1948, and then at Fort George G. Meade, Maryland until separation in 1949. He married Norma J. Postel in 1953 and they had 3 children, Steve E. Lance of Ashland, Susan E. Lance of Whitesburg, Georgia, and Jennifer M. Lance of Sardinia, Ohio. In addition to his children he is survived by brother, Melvin Lance of Winston Salem, North Carolina; his former wife, Norma J. Lance of Ashland; four grandchildren, Thomas, Elizabeth, Katherine, and Daniel Bohl; along with his son in- law, John Bohl of Sardinia. 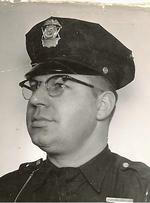 After several jobs, he was appointed to the Ashland Police Department in May 1958. He began as a patrolman and was promoted to all ranks within the department. He was the first officer promoted to Captain and was the first officer assigned to plain clothes as a detective. He set up and ran an identification division and a detective division, and worked as a detective for 12 years. He retired in 1980 as a Captain. Mr. Lance was a life member of the Veterans of Foreign Wars, Post 1067 since 1950 and held offices of Jr. Vice Commander and Sr. Vice Commander. He was also a life member of the American Legion, Post 88, Ashland, Ohio, since 1980, and served as Commander on 3 different occasions. He assisted with the Bingo program for 15 years and assisted the American Legion Baseball team for 12 years. He was also a life member of the Am Vets, Post 96, Ashland, Ohio for approximately 15 years. After retirement for the police department, he worked at various part time jobs including Hawkins Market for 8 years, Smith Hardware, Bellville, Ohio for 3 years, and he transported many citizens to airports, hospitals, doctors visits and other appointments in Columbus, Cleveland and Akron for many years. Mr. Lance was a member of Maple Grove Brethren Church. He loved to travel, especially the West, and visited every state in the USA except Alaska. He hunted deer in Wyoming for 15 years and loved this state especially. A Memorial Service will be held at the Heyl Funeral Home on Saturday June 23, 2012 at 3:30 P.M. with Pastor Rob Barlow officiating. Military Honors will be presented following the service by the Ashland Veterans Honor Guard. Friends may visit with the family one hour prior to the service at the funeral home. The family suggests memorial contributions may be made to Associated Charities 121 W. South St. Ashland, Ohio 44805.